If you want to dip your toe into the world of high-end audio without spending too much, these are a great way to get your feet wet. If you don't take great care of your headphones, then you'll want something tough like the V-Moda XS. When it comes to comfort and battery life, the Bose Soundlink On-Ears get it right. The ANC effectively quiets annoying noises like the hum of a subway, while aptX support means you benefit from high-quality streaming. Battery life is also outstanding. At under $200, the Beyerdynamic DT Pro headphones are well on their way to becoming classics. Okay, so you’re in the market for a solid pair of headphones, but don’t want to spend your grocery allowance for the month. Fortunately, there are plenty of sub-$200 cans out there. Initially, the investment may be difficult to justify, but doing so will keep you satisfied for years to come. Rather than sending you off on a wild goose chase, we’ve saved you from the grunt work and put together a list of the best headphones under $200. Editor’s note: this list was updated on March 28, 2019, to include the JBL Live 650BTNC. The Monoprice Monolith M565 is priced a hair under $200 and still manage to implement planar magnetic drivers. As a disclaimer, these aren’t the best sounding headphones under $200 because they’re the most neutral; they’re not. Rather, they’re the best because they transition listeners from the world of consumer audio to hi-fi audio. Some may balk at the overemphasized bass, but the Monoprice Monolith cast a wide net, pleasing a majority of listeners. The planar magnetic drivers make each bass note easy to differentiate, without resulting in receded midrange frequencies, unless the volume is cranked up all the way. As far as the treble is concerned, this too receives a dash of overemphasis. Contrary to most exaggerated treble reproduction, the Monoprice Monolith M565 don’t fatigue the ear and will please consumers by adding a touch of perceived clarity to a given song. What’s more, the soundstage benefits from the open-back design. Black metal grills and wood-finished earcups give the Monolith M565 a premium look and feel, but this design comes at the expense of isolation. For listeners looking to get the most out of these headphones, stick to quiet, indoor environments. Anyone who’s interested in upgrading their current headphones without having it cost an arm and a leg. The headphones that appear are all the valedictorians of their class. If you find yourself thinking that you want to further explore and experience what the audio world has to offer, any of these will be an excellent starting point depending on your needs. There’s no doubt that the Monoprice 8323 are a great pair of sub-$50 headphones, but entering the “under $200” category opens a greater variety of options. What’s cool about this class of headphone is that they represent the next significant step into learning what you favor in a product. From soundstage, active noise cancelling, comfort, or whatever else, investing in headphones under $200 weeds out generalities that accompany lower-caliber products. Need something tougher than Dwayne “The Rock” Johnson? The V-Moda XS take note from the field of military design, and like the company’s other offerings, are built like a tank. The exterior is decked out with aircraft-grade aluminum, and due to V-Moda’s Cliqfold design, they quickly become compact. Speaking of which, for such a small pair of headphones, these are equipped with sizeable 40mm dual-diaphragm drivers. The metal plates are removable for easy replacement. Moving down, where the cable is usually the most fragile part of headphones, the V-Moda XS has a removable cord protected by a Kevlar weave for ultimate durability. Should you somehow ever break the cable, you can always get another one on Amazon for about $15. Makes no sense to toss the baby out with the bathwater, right? The fit is snug but can be good. V-MODA claims that reducing the distance between the drivers and your ear will improve sound quality. Overall, the signature is heavily altered with emphasized bass. In sum, if you’re looking for a rough-n-tough pair of headphones that sound good and stand out, the V-Moda XS will last a lifetime. 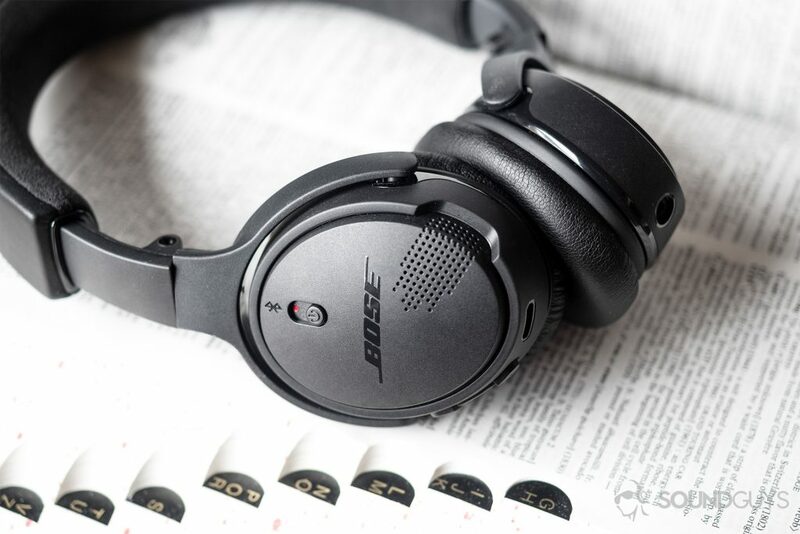 Typically, on-ear headphones are the least comfortable variety of headphones, but consumers who are well-acquainted with Bose know that the SoundLink On-Ear Wireless is an exception. All-plastic, featherweight construction keeps the weight at 161 grams; that combined with pressure-relieving padding makes these some incredibly comfortable headphones under $200 that are perfect for travel. Improving upon the Bose SoundLink On-Ear Wireless’ already minuscule footprint is the ability for them to fold up at the hinges, halving their size. For consumers who have an aversion to precariously placing headphones into bags, Bose provides a zippered carrying case, reminiscent of the CD cases of yesteryear. Another great feature that’s conducive to portability and transient lifestyles is the well-implemented Bluetooth and multipoint technology. The headphones pair quickly, connect quickly and can stay connected to two devices simultaneously. For commuters who favor passing the time with TV and movies, the SoundLink On-Ear Wireless relay video without any audio-visual lag. Also, Bluetooth means that users won’t find themselves tangled in a web of wires and don’t have to worry about cables catching on door handles or strangers. As if that weren’t enough, Bose’s dual-microphone system in tandem with Active EQ effectively mitigates ambient noise while placing emphasis on clear voice transmission. All of this makes for a compelling pair of headphones under $200. Finding good, reasonably priced noise cancelling headphones is a challenge. Fortunately, the Edifier W860NB is a great sub-$200 option. Although passive isolation is just ok, switching on the ANC toggle makes a world of difference. What’s more, the Bluetooth connectivity is reliable and supports multipoint connectivity. This means you can connect to two devices simultaneously and switch between them. Battery life is solid as these headphones provide a long 31.6 hours of constant playback before requiring a top up. A full charge cycle takes about three hours with the include microUSB cable, which is pretty good considering the battery’s mileage. Audio quality is great as these have a fairly neutral frequency response; that coupled with aptX support makes for a clear, detailed sound. Unlike the previously listed JBL Live 650BTNC, these drivers aren’t as prone to auditory masking. Since bass frequencies aren’t too emphasized, you can listen to a wide array of genres and enjoy and accurate sound. Okay, they’re not actually a pillow, but these are the most comfortable headphones under $200. As if that isn’t convincing enough, the DT 990 Pro is beloved by enthusiasts and producers, alike. Concerning low-end reproduction, the DT990 Pro keep it clean without entering eardrum-shaking territory. Some may consider the bass to be lacking, but it benefits audio engineers when it comes to hearing and remedying overemphasized vocals and sibilant treble reproduction. Keeping the headphones comfortable is an (almost) entirely plastic build and velour-wrapped, memory foam ear pads. Adding to the comfort is the coiled cable (1m) that allows for travel within a studio space without having to do the constant on again, off again headphone tango. Of course, all this plastic compromises durability. They aren’t going to be able to take being shoved into a bag like the V-Moda XS, and the steel-reinforced headband is flimsier than others. Also, remember that cable? It’s not removable if it breaks you’re S.O.L..
All that said, the Beyerdynamic DT 990 Pro aren’t travel cans, and Beyerdynamic doesn’t advertise them as military-grade anything. Instead, these are for long listening and editing sessions, which they excel at, making them some of the best headphones under $200. JBL Everest 710: The Everest 710 is a comfortable pair of circumaural headphones that provide 25 hours of playback on a single charge. Though at first glance they’re rather large, the headphones fold up and can lay flat for convenience. JBL Live 650BTNC: Passive isolation is ok, but switching on the ANC toggle makes a world of difference. What’s more, the Bluetooth connectivity is reliable and supports multipoint connectivity. This means you can connect to two devices simultaneously and switch between them. Although we’ve directly reviewed a vast array of products here at SoundGuys, we haven’t gotten around to all of them. After all, we’re only human and are inherently subjective. To counteract our unavoidable bias, we do quite a bit of research by perusing online forums, reading other reviews, conducting our own Twitter polls and more. The P2i water-repellent coating isn’t as good as an official IP rating, but after soaking the ear cups, the headphones held up without any issues. Bluetooth headphones are increasingly salient while their wired counterparts are getting passed over by many consumers. Bluetooth is convenient, ideal for commuters, and headphones are often used as a buffer from the world. That said, there’s no denying that sound quality caps off much quicker with Bluetooth headphones than wired ones. We at SoundGuys understand that there are reasons to buy Bluetooth headphones and reasons to avoid them. Here’s a quick guide on what you need to know. For headphones under $200, wired provides a greater bang-for-your-buck than Bluetooth. Generally speaking, wired headphones outperform their Bluetooth brethren. It all comes down to bandwidth. Bluetooth doesn’t have the necessary bandwidth to keep pace with wired headphones, especially when you bring amps into the conversation. If convenience is your biggest need, you may choose to forgo the best sound quality and invest in a Bluetooth model instead. There are even true wireless earbuds now that completely ditch the wire like the Airpods. 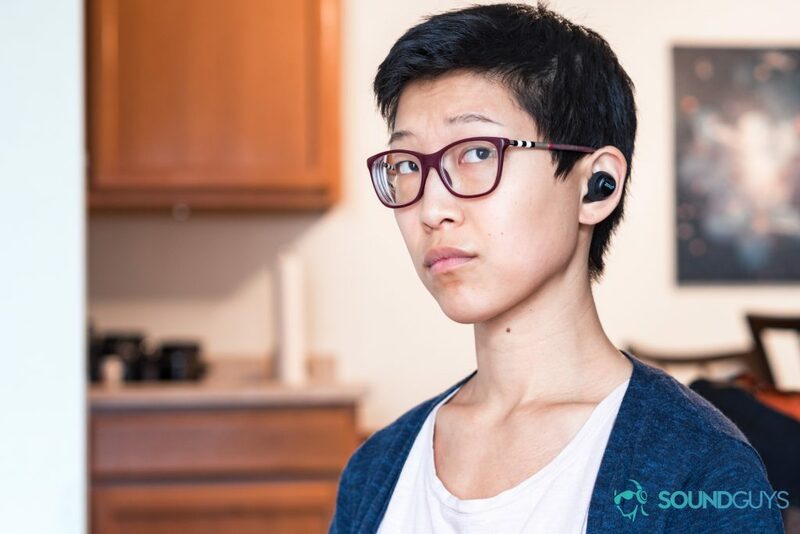 Bluetooth isn’t great, but you probably can’t hear it anyway. Depending on your age and how long you’ve been exposed to loud noises (like how many concerts you’ve gone to), you might not be able to hear the upper limits of the frequency range anyway. If you want to test your ears, check out our simple but effective hearing test. Not only is this site our nine-to-five, but each of us has multiple years of reviewing consumer audio products. We’ve kept tabs on the ever-changing world of audio, giving us the ability to parse apart the gimmicks from the gems. As frequent visitors of SoundGuys already know, Chris wears his hatred for all things Bluetooth like a lovesick teenager wears his heart on his sleeve. The Bluetooth products listed? They’re damned special. Adam, a SoundGuy for nearly three years, has heard everything from pristine highs to vacant lows. Then there’s Lily with countless hours clocked in at a radio station working in a professional studio environment and reviewing audio products on her own time prior to joining SoundGuys. Here at SoundGuys we test all sorts of headphones from wired, to true wireless, and we’re here to help make your next purchase easier.